Hispanic voters increasingly identify with the Democratic Party. 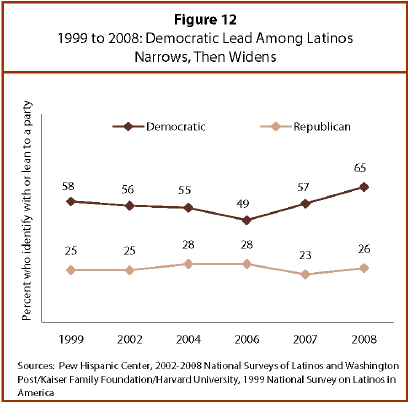 Among Latino registered voters who self-identify with either political party or who say they lean toward that party, Democrats now hold a 39 percentage point advantage, larger than at any time over the past decade, with 65% of registered voters identifying themselves as Democrats or leaning toward the Democratic Party, and 26% identifying as Republicans or leaning toward the Republican Party. This trend of growing identification with the Democratic Party is also observed among the general population. According to the Pew Research Center for the People and the Press, among all registered voters, Democrats hold a 16-point advantage with 53% of registered voters identifying as Democrats or leaning toward the Democratic Party (up six-percentage points over 2004), and 37% identifying as Republicans or leaning toward the Republican Party (down four-percentage points since 2004). Considering those who identify with a specific political party, and excluding party leaners, over half of all Latino registered voters identify themselves as Democrats (51%). Just 16% of registered voters identify themselves as Republicans, and 23% identify as independents. Among Hispanics registered voters who identify as Democrats, Republicans or Independents (excluding leaners), men are more likely to identify as Independents than are women—28% versus 19%. Those ages 55 and older are more likely to identify as Democrats than younger Hispanics. Those who identify with a religion but are not Catholic are more likely to identify as Republicans than are Latinos who are Catholic—24% versus 13%.